Dealing with insurance companies is a burden. When you're facing injuries, medical bills, and missed work, the Olson Law Firm is ready to go to work for you. Reach out today. We know that choosing a lawyer to help with your personal injury claim can be over-whelming. At Olson Law, we try to make things easier for you. We make it a point to listen closely to the details of your case - and consultations are always free. The Olson Law Firm has handled numerous car accident claims for our clients. A truck accident can leave you with serious injuries. We can help. Please reach out for assistance with Medical Malpractice claims. An injury on someone else's property can leave you with expensive medical bills. We can help. Learn more about wrongful death claims in Colorado. If your employer is treating you unfairly and breaking the law, we want to help. A good personal injury lawyer focuses on keeping their clients informed. This is why Sean has created as series of FAQ Videos that explore common questions clients ask. How Much Will My Brain Injury Settlement Be? 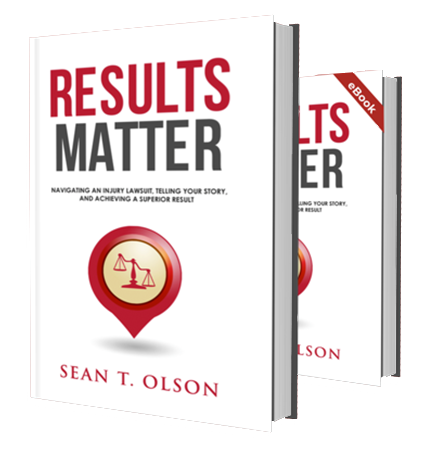 Your Free Copy of Sean Olson's "Results Matter"
Sean Olson is a trial lawyer and founding member of the Olson Law Firm. Sean practices law in Colorado and Wyoming. His practice focuses on providing unrivaled representation in and outside courtrooms at the state and federal level. Prior to founding the firm, Olson served the law enforcement and business communities as a partner at another prominent law firm and as an associate attorney at a national litigation firm. Olson’s experience at those firms allows him to offer the same high-quality service provided by large Seventeenth Street law firms at a fraction of the cost. To get started on your case, contact Sean today. The Olson Law Firm focuses on helping people in need. After a serious injury from a car accident, slip and fall, or medical negligence, you want answers. We make it a point to listen to our clients and make sure they understand each step of the injury claim process. Our main office is located in Denver, but we’re also open in Cheyenne, Wyoming and we’re more than happy to meet you there. We’ll even pay a visit to your home to discuss your case.